Theresa M. Reineke is a Distinguished McKnight University Professor in the Department of Chemistry at the University of Minnesota. She also holds graduate faculty appointments in the Departments of Chemical Engineering/Materials Science and Pharmaceutics. 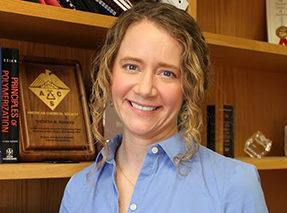 Her educational background includes receiving a Bachelor of Science from the University of Wisconsin-Eau Claire, a Master of Science from Arizona State University, and a Ph.D. from The University of Michigan. She then received a National Institutes of Health Postdoctoral Fellowship to further her research background at the California Institute of Technology prior to beginning her independent faculty career. Her research group is currently focused on enabling fundamental and applied technology advancements of polymers in the fields of gene and cell therapy, oral drug delivery, and sustainability for which she has published more than 110 peer-reviewed manuscripts and received several awards such as the American Society of Gene and Cell Therapy Outstanding Investigator Award, the National Institutes of Health Director’s New Innovator Award, and the American Chemical Society Division of Polymer Chemistry Carl S. Marvel Creative Polymer Chemistry Award. Reineke is also a founding Associate Editor of ACS MacroLetters and currently on the Editorial Advisory Boards of the ACS journals Biomacromolecules and Bioconjugate Chemistry.